Karnea has often been called, “The Greatest of All Delt Events.” Why is this? Is it because Karnea is the largest gathering of Delts – undergraduate and alumni alike – at any Delta Tau Delta Fraternity event? Perhaps it’s because Karnea is the primary legislative occurrence every two years; the time when the governing documents of the Fraternity can be changed. Or, perhaps, it’s because the Arch Chapter is elected and installed to begin its work in leading the Fraternity. Karnea is the greatest of all Delt events for all the reasons noted. 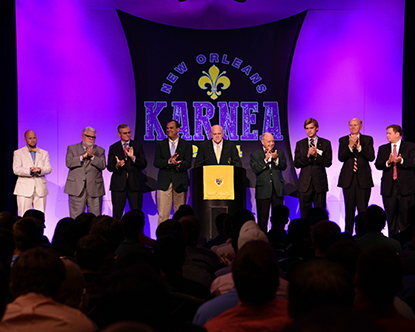 Karnea is a grand event, the Fraternity’s biennial convention. Karnea, which means “festival of Apollo,” is an event each member of the Fraternity should attend at least once in his life for in no other place does the Fraternity come to life in so many ways. Discover, Transform, Dream is our theme for the 2016 Orlando Karnea. Conference programming will center on these key ideas. We will provide our guests the opportunity to discover and explore the role they play in the life of the Fraternity and the role their chapter plays in the greater organization and on campus. We will all share transformative experiences, each taking a seat at the table built 158 years ago by our founders. We will dream about the next steps needed to truly become the best version of ourselves. Participants can expect a wide variety of programming including a half-day housing summit, a New Advisor Development Institute (NADI), a seasoned advisor “refresher” course, and a variety of Road programs to enhance the work of member and new member educators in chapters. Featured keynote speakers will be announced in the spring and promise to make us think and take action to improve ourselves and our Fraternity. For 2016, our Karnea host is the Hyatt Regency Grand Cypress located in Orlando. Karnea will be Aug 3-7. This will be the first Karnea in Florida and the first resort property to host Karnea since Coeur D’Alene, Idaho in 1990. The Hyatt Regency Grand Cypress features all the amenities one expects from full service resort facilities including spa, multiple pools, a variety of dining options and price points, beach with activities, and multiple golf options. The Hyatt Regency Grand Cypress is a fitting host for our biennial convention! Continued to check www.delts.org for more information on Karnea.